Hi there! I tried another new Astor nail polish the other day. I couldn’t warm up to the colour at all, so I decided to do what I did the last time I didn’t like my mani – I spruced it up with a floral pattern. 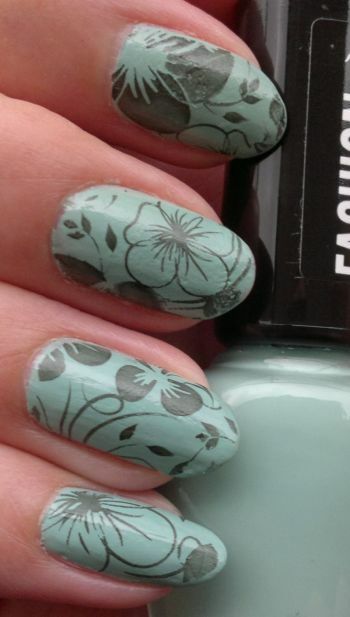 This time I chose another floral stamping plate, Pueen 73 from Pueen’s Stamping Buffet collection. In case you’re wondering, the black polish is Revlon Colorstay. 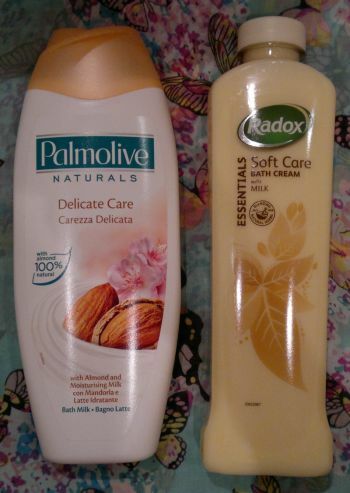 Palmolive Delicate Care with Almond and Moisturising Milk is a long-time favourite. The milky formula is gentle to the skin and the sweet almond scent is simply divine. I hope Palmolive will never discontinue it. Radox Essentials Soft Care Bath Cream with Milk is a rather new favourite of mine. I only discovered it recently but I’ve already bought a few backup bottles because I’m in love with its creamy, dreamy, yoghurty scent. Both bath milks are available as 500 ml and they’re always on special offer somewhere – usually around £1 or slightly less. Hi there! If you follow my blog and read even my most random posts, you know that I am obsessed with Carex Bubble Gum hand wash.
OK, this is only a hand gel. I realise this. But seriously, I love this bubble gum scent so much. And I bought a bottle for my husband too! So yes, Carex Fun Edition Bubble Gum Refreshing Hand Gel is my product of the month. 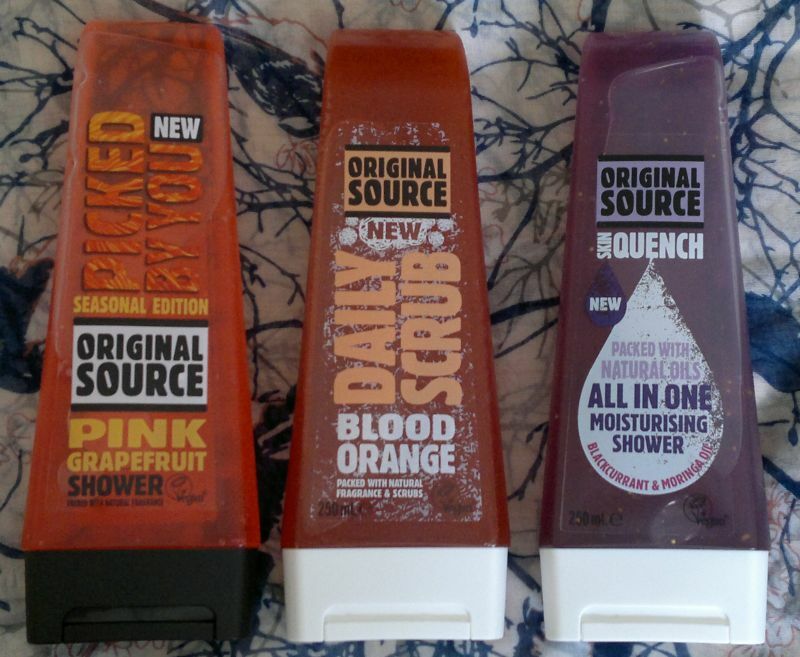 At the moment it’s 99p only at Asda and Superdrug, so there’s no excuse not to buy it. And don’t forget to buy the Carex Bubble Gum hand wash! It’s the most delicious hand wash I’ve ever had. I love it that when I wash my hands with it before I go to bed, I can still smell it when I wake up in the morning. If there is such a thing as The Ultimate Happy Time Hand Wash, then this is it! Hi there! Ages ago I received a small bag full of sample-sized toiletries as a wedding favour. The bride knew I loved toiletries, so she compiled a small bundle of bath & shower treasures for me. One of the products from this gift bag was this shower gel: Bronnley Lemon & Neroli Bath & Shower Wash. I have to say I was pleasantly surprised by this little gem. It lathers very well and even though it’s not a shower cream, it’s quite gentle to the skin. However, I’m a bit on the fence about the scent. Lemon & Neroli is a combination that’s often considered to be old-fashioned by today’s standards. Whilst I find the scent pleasant, I don’t think it’s special. Saying this, I really want to try the matching body lotion because I’m sure that Bronnley’s toiletries are of good quality in general. Bronnley is a traditional brand and a British Royal Warrant holder. This means that the company supplies its products to the Royal Family. Whilst Bronnley is not a brand that would appeal to teenagers and twenty-somethings, I’ll definitely try more of their products; Bronnley’s fragrances seem to be good value! Hi there! Today’s post is about a product I found at my local 99p Store: Pantene Aqua Light 2 Minutes Light Nourishment Masque. I love my local 99p Store. They often have great toiletries – discontinued gems, products from different countries, and readily available toiletries for a reasonable price. However, before I consider buying imported products, I check where they’re from. This hair treatment is from a EU country which – just like the UK, Germany or France – follows EU regulations; this means I was happy to buy it. I also like this product’s scent which I would describe as fresh and clean, a bit generic, but definitely pleasant. It is my understanding that this product has been discontinued. Whilst Pantene displays other Aqua Light products on its web site, this hair mask seems to be gone. Too bad! But in the meantime I can paint and stamp as I like. 🙂 I’m now wearing Astor Fashion Studio 242 Aqua Leaf. This polish is quite thick so it wasn’t as easy to apply as I hoped. So yeah, it didn’t look right. On top of that I woke up to streaks and sheet marks (I blame the hot weather) so I had to do something. I thought stamping would be the easiest option, so I chose a random black nail polish and one of my Pueen stamping plates, Pueen 72 from Pueen’s first Stamping Buffet collection, to cover up the sheet marks. It’s not perfect, but if you don’t stare at my nails for too long, you’ll probably agree that this mani doesn’t look too bad considering how horrible my nails looked when I woke up. 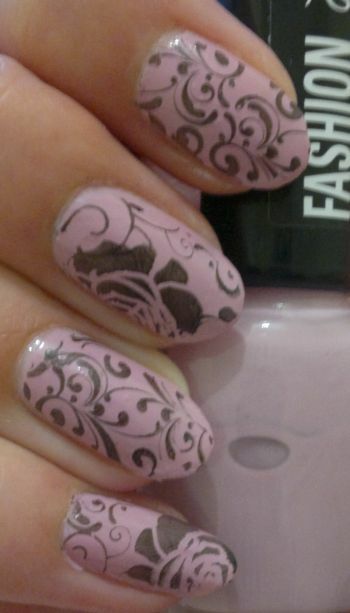 Plus: I’ve learnt that all-over stamping is a great idea when you have little time to fix your mani properly.